Home » The Evil Stepmother Blog » Bio Mom, Bonus Mom, Boundaries, Bullying, Children, Community and Society, Divorce, Evil Stepmother, Fear, Girlfriends, Gossip, Home Wrecker, Mother, Parenting, Parenting, Power, Remarriage, Respect, Spouse, Stepchildren, Stepdaughter, Stepfamilies, Stepfamily, Stepfamily Advice, Stepfamily Day, Stepfamily help, Stepmom, Stepmom Advice, Stepmom Help, Stepmother, Stepmother Advice, Stepmother Help, Stepson, The Ex, Women » Stepmothers and Mothers: We Should Know Better! 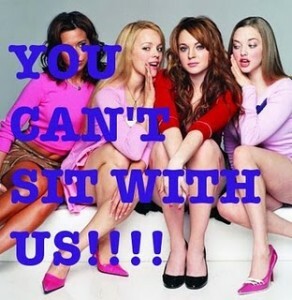 Are We Like the Mean Girls in High School? Have you ever felt as if your stepfamily life mirrored your high school years? Girls talking about one another? Never feeling as if you were good enought? Pretty enough? Smart enough? (Sounds like the SNL character Stuart Smalley) Life in high school was stressful. It was like you were uncomfortable in your own skin, right? Do you feel the same within your own home? Do you point to the other woman as the culprit? Stepmothers blaming mothers. Mothers blaming stepmothers. Does Stepmom talk about Mom and Mom talk about Stepmom? Are they calling their friends to complain about the other? Or, are they talking to their partner/ex-partner about the other woman? Doesn’t that sound like high school when two girls liked the same boy? We should know better! The crux of the issue is that our divorces and remarriages remind us of our high school romances. In high school, when a boy started to date a new girl, gossip and broken hearts ensued. There were teams of supporters. Your girlfriends stuck with you through thick and thin. The new girl had her posse of friends as well and the friends stayed loyal to their team. Neuroscience teaches us that our left brain only knows what it has seen and experienced. It does not have the capacity to think whether it was wrong or right. It just knows that this happened and it was painful. The brain only knows that pain may happen and it wants to protect us. As a result, similar reactions to similar experiences repeat themselves. The same anxiety that we felt in high school could be replicating itself in our stepfamily lives. Most importantly, how do you think our behavior looks to our children? Actually, it should look very familiar to the kids because they see that kind of behavior every day at school. Our children look to us for security and wisdom. When we act like children, our children feel unsafe. They have no one to rely on and they do not know what to do. Our children are looking to their mothers, stepmother and mother alike, for guidance. When we call each other names and argue, we are abandoning our children. Respect is lost. The children are scared. They are stuck in between two women who should know better. When we call the stepmother or mother a b—-, what are we teaching? When we argue about schedules and money, what do we expect from our children? In many cases, we want the children to be ‘on our side’. We are recruiting people to be on our team, just like we recruited our friends in high school to side with us. This team building was not fun in high school and it is not fun now. Our brains are recreating the same scenario because that is what makes us feel safe. We should know better by now that creating teams among mothers is no way to behave. Do stepmothers and mothers act like bullies towards one another? They talk about each other often. They talk to others about each other. The talk is almost always negative and its purpose is to create gang support. It’s bullying. We should know better. ← HOW TO TRANSFORM FROM DESPICABLE ME (THE STEPMOTHER) TO HAPPY!